Photos by Rob Rice Sr. The fate of the Lido Class is safely in the hands of its thirteen-year old sailors. This band of teenagers (all not exactly thirteen, but it seemed to their average age) displayed a sense of sportsmanship and competitive camaraderie of which senior Lido sailors can only dream. The Junior National Championship occurred last Saturday under such perfect conditions on Alamitos Bay it was as if the event was ordained from on high. It makes sense though, because Alamitos Bay may just be sailing’s proverbial Garden of Eden. The day was blessed with a gentle southwest breeze under sunny cloudless skies. Onlookers knew the day would be special when the young Lido sailors congregated before the skipper’s meeting in ABYC’s quarterdeck, solemnly bowed there heads, and silently listened to the gospel according to "SpongeBob Squarepants" from ABYC’s extensive collection of inspirational DVDs. Jim Drury, of "Fudd" fame, was the days PRO with Sarah and Mark Ryan serving not only as Regatta co-chairs, but Jim’s disciples on board ABYC’s Bay Barge. Rule 41 "Outside Help" was abandoned for the day while the Committee Boat handed out lollipops and ice-cold sodas. Courses were limited to windward leewards, (with no more than three times around for fear the younger contestants would lose count). The races were extremely well sailed by all the contestants. There was not a single general recall during the entire five race series. The juniors started beautifully, with very few second row starters. Almost all the teams executed roll tacks with acumen. Buoy roundings were very close, with large clumps of competitors rounding properly, without screams of "protest". Fortunately, class president Stu Robertson was there to takes notes for the Senior National Championships next year. It is believed that he will institute a mandatory "Sponge Bob" rule for the 2010 Seniors National Championships. Sadly, competition does require a specific winner. At the lunch break, a mere 10 points separated the top 7 positions. Hometown favorites Rob "Iceman" Rice and Kevin "Ironman" Leddy (3-1-10-1-2), sailing the Ryan’s "Cruisin’ n Losin", secured final victory with a 1-2 after the lunch break. The number two team came prepared for Thistle sailing with a crew of three. Christoph Killian / Harrison Vanderbort / Jack Martin, from Balboa Yacht Club (10-2-2-4-3) all weighed in at less than 200 lbs and still had to carry weight. It is believed they used this to their advantage by having a port tack/starboard tack crew. Brandon Ludgate / Brett Potter (4-3-1-11-4) would have posted better scores but it is believed they suffered from whiskerpolephobia, a rare malady that affects mostly Sabot sailors. There were a gaggle of competitors who were always in the hunt, making the top finishers sail their personal bests. The ABYC/ Leeway combine of Steven "Buy me a razor" Hopkins and Bryce "Birthday Boy" Hatch (7-10-9-2-1) finished the day off with a bullet. Jamie Jones/Chris Bilichich (Cabrillo Beach Yacht Club) (1-7-11-5-5) somehow managed to finish ahead of the Marina Del Rey Rockstars Phoebe and Celena Staff (8-4-5-3-7), even though Jones and Bilichich spent the day chasing after the Staffs. The Staff sisters promised to return next year under the conditions that a) there would be a throw out and b) more cute guys showed up. Getting in between those two teams was John "Spin" Makielski and Alex "A-Cat" Westland (5-5-7-3-12). "Spin" and "A-Cat" never found a buoy they didn’t like, getting up close and a little too personal with three of them during the course of the regatta. Davis and Mila Bakker, ABYC (6-8-4-9-9) learned that a centerboard was useful to windward, but handled their Lido extremely well. Mike "Mountain Lake" Anctil / Dallas "Vegas" Haun, ABYC/Leeway (2-9-13-8-7) were just able to compete because "Vegas" was flown in from a show date in Nevada just in time for the event. Matt "Pokemon" McDermaid/Dugan "Hipster" Farrell, ABYC, (9-12-5-10-6) displayed beautiful sportsmanship by returning after being OCS even though in there heart of hearts they thought the line spotter was a blind old fool (the author). Palmer "American Idol" Luckey / Brian "Get me out of here" MacLean ABYC (11-6-6-12-10) spent the day serenading the fleet. Siblings Peter and Lizzy Hays (12-11-8-6-8) from BYC probably had enough of the 13-year olds by the end of the day, but all in all Peter and Lizzy seemed to enjoy themselves. The true heroine of the day was Bridget Luckey with skipper Andrew MacLean ABYC (13-13-12-13-DNC). She epitomized sailing as fun by soaking her feet in the cool bay waters during the weather legs and lounging on the foredeck, working on her tan, during the downwind legs. Kate Bishop came in to substitute for Andrew in the last two races, but Bridget and Kate retired early to sneak into the trophy room. There was rumored they would be protested under Rule 5 for using "Controlled Substances" but it turned out that she was only drinking the non-awarded, but heavily caffeinated, trophies: liter bottles of Coca-Cola. Red Bull was to be next year’s sponsor but Mr. and Mrs. Luckey pleaded otherwise considering that Bridget wouldn’t be sleeping for a week. 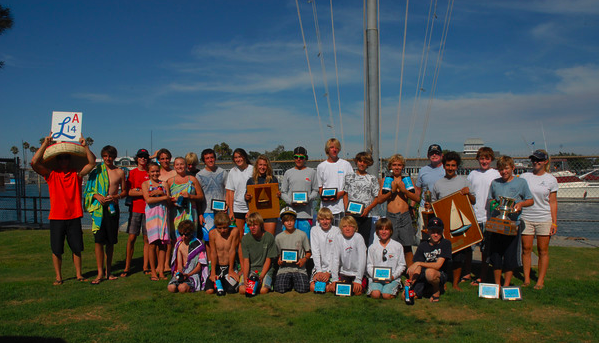 Alamitos Bay Yacht Club will put in a bid to host the 2010 Junior Lido Championships. 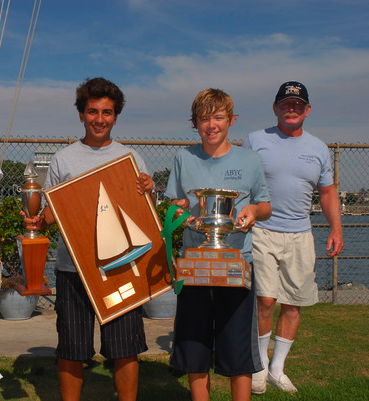 Fleet Six had several more boats available for any other Junior teams this year, who had wished to compete, and extends an invitation to all other yacht clubs just to get their teams to ABYC and Fleet Six will find them a boat. The gentle breezes, flat water and divine ambiance of Alamitos Bay seem ideally suited junior sailing. This year, Rob "Iceman" Rice / Kevin "Ironman" Leddy earned the coveted green "L" and the Lido Association hosted a national event with no general recalls, no protests, and no unexpected change of officers. And there was a pizza party to boot! It can happen again. Heaven on earth! More pictures are available offsite - please click on this link to view. Alamitos Bay Yacht Club, Lido 14 Fleet 6, and regatta co-chairs Mark and Sarah Ryan invite all Junior members of the Lido 14 Class Association, and eligible guests, to compete in the 2009 Lido 14 Jr. Class Championship Regatta on August 29, 2009 at Alamitos Bay Yacht Club. Spectators are invited to watch the event from the club grounds, the bayside beach, or the vantage point on Naples Island. There will be a dinner immediately following the trophy presentation that spectators, family members, guests, etc. are welcome to attend. To learn more about eligibility, to reserve a charter boat (limited supply, available on a first come, first serve basis), or to get assistance in finding a crew, contact Sarah Ryan.